With over 35 years of truck experience, Kustom Fit began by manufacturing reclining seats for the most expensive recreational vehicles. Today our custom seating can also be found in automobiles, vans, pick-up trucks, Jeeps™, transit buses, and of course, heavy trucks. Our success has been our innovative ability to engineer and combine complete customer satisfaction with long distance driving, lasting comfort, fashionable styling, function, and the quality of the finest luxury car seating. 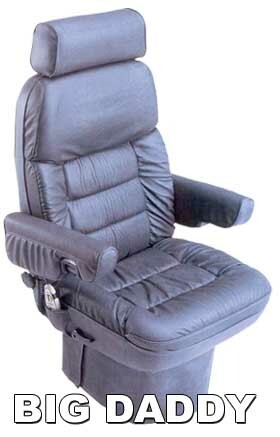 We are proud to offer the trucking industry what we consider to be the finest, most comfortable, highest quality, best engineered and most thoroughly tested seating money can buy. Kustom Fit’s Luxury Heavy Truck Seating can be installed to most existing air ride pedestal applications, saving you the expense of replacement. However, if you do replace you pedestal, our seats are adaptable to many quiality brands of air suspensions from which you can choose. Kustom Fit/Hi-Tech Seating Products, Inc. Hereby warrants all of its seat frames against defective steel structure and workmanship to the original owner forLifetime. Other components and workmanship are warranted for 200,000 miles or one year from date of purchase. Upholstery fabrics are warranted directly by the fabric mill. See compelete warranty for the complete description and other details. Note: Front Driver/Passenger seat applications fit most OEM Factory pedestals and slide tracks except Ford. Ford Van Seats require an aftermarket pedestal for installation. SEE PRICE SHEET.